AccuFit will proceduralize and accelerate the number of planned orders you can deliver to production with the assurance that the planned orders are accomplishing the financial and operational goals of the company. AccuFit's patented scoring system will prioritize the best fit material in inventory to match to each sales order. 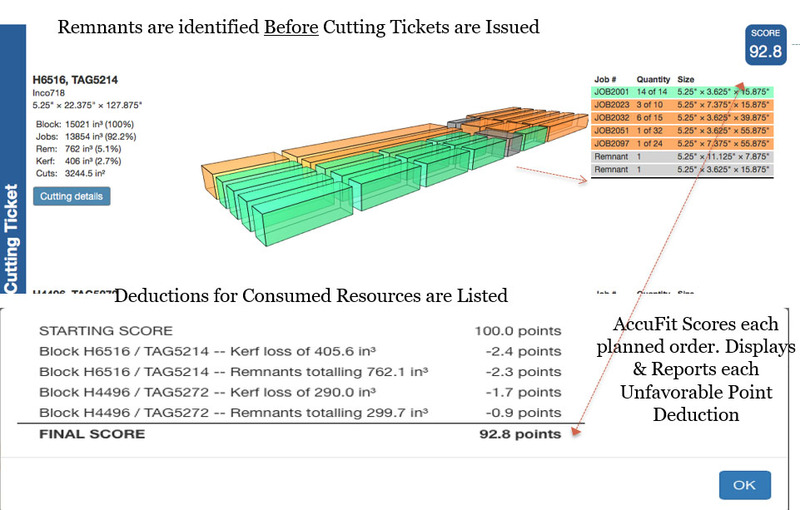 The planning function will be consistent for all your planning engineers and result in high yields and low scrap. Aged remnant inventory will be selected before full size material is cut. Reduce and push out the quantity of new full size material ordered to support production by consuming remnant and aged inventory first. Integrates with your ERP/MRP Software – Oracle, SAP, MAS 90, etc..
How does AccuFit Improve your Company?